Welcome to the user manual for Creo. This documentation will help you become familiar with the powerful set of features available in Creo. 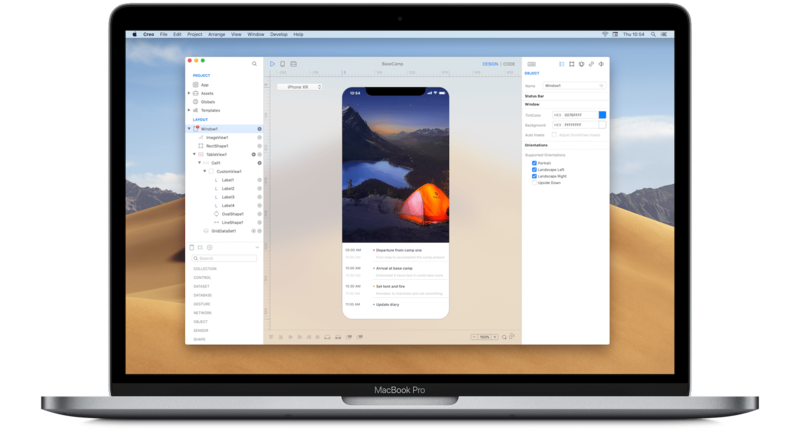 Creo is an advanced macOS application that helps you create native mobile applications much faster than with others traditional tools. Creo combines the traditional design and development phases process into one highly optimized and easy-to-use tool. In order to use the latest version of Creo, you must be running OS X El Capitan (version 10.11) or higher. Creo is about 140MB in size so you don’t need to have gigabytes of free space, and runs perfectly on any machine from MacBook Air to Mac Pro. If you haven’t done so already, you can download the latest Creo version from https://creolabs.com/download. You can use Creo for free as long as you want with some limitations. No App Store deployment, no Analytics and no Code Exporting. If you need to publish on the App Store or have access to all the features then you need to purchase a plan. 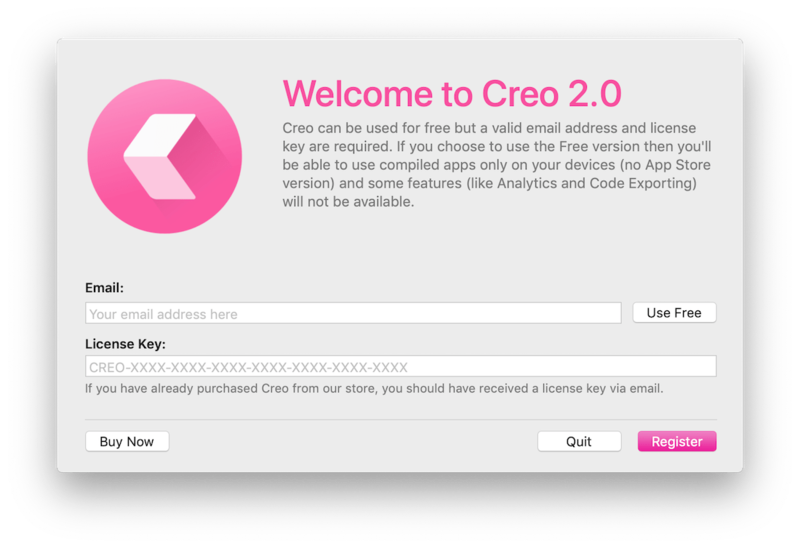 Creo 2.0 requires a registered email and a license key (also for the free version), if you want to test Creo for free, then insert a valid email and select Use Free in the Registration Dialog. Need further help getting started with Creo? If you ever come across any issues relating to registering Creo, or anything else, then you can find more helpful information here as well as in our Support section. We hope you enjoy using Creo!